Happy Monday! Wait? Did I say Monday… yep, I totally did. Ok. 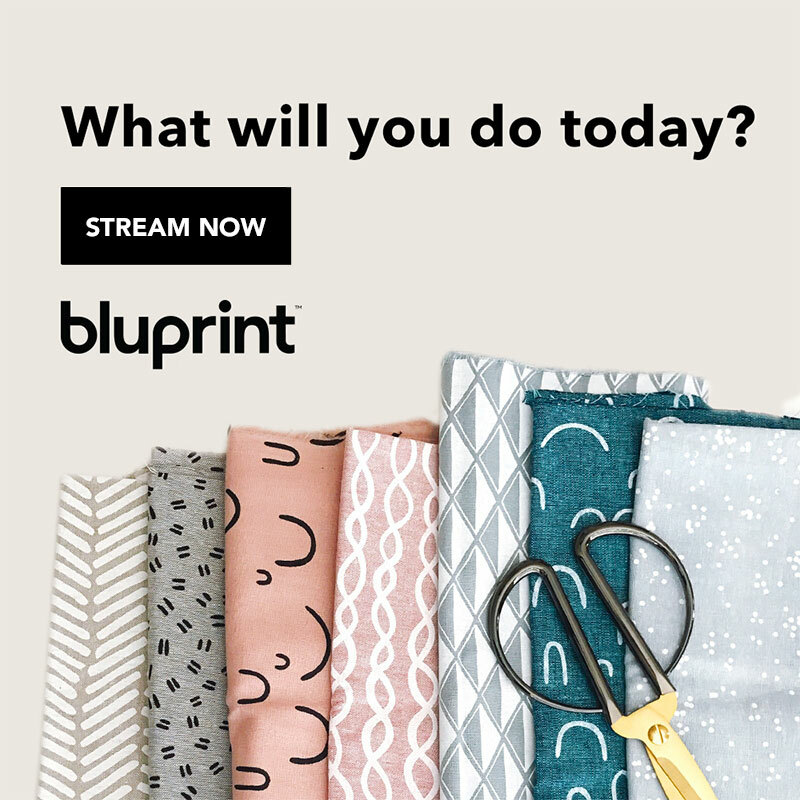 I know that’s a goofy way to begin this post but I almost always post on Tuesday but this week I’m posting on a Monday for a REALLY good reason – the 2018 Stitch & Hustle Blog Hop! How awesome is that? When Michele asked me to be part of this hop I was blown away, then she said that Lion Brand Yarns was sponsoring it I nearly died. Then I saw the other designers on the list – A Crocheted Simplicity, Rescued Paws Designs, Evelyn & Peter, Mama in a Stitch, Stitch & Hustle, & Sewrella! Wow! Do you remember feeling like the kid hanging with the upper-class students? Because that’s where I am right now. Just feeling like I’m pretending I’m as cool as all these women. Regardless of how my impostor syndrome is acting up, I’m so excited for this opportunity. 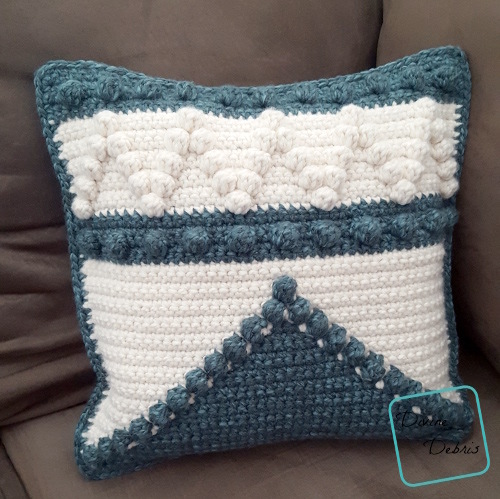 I have had this pillow idea in my head for a few months & I knew some ultra squishy Wool-Ease was going to be the best to use to really highlight the bobbles. 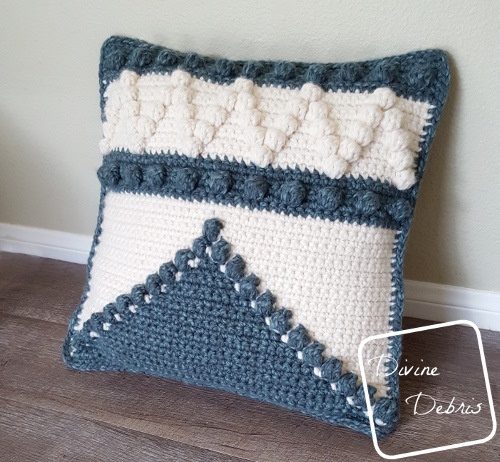 This design worked up SO fast with that large yarn that I hope you all out there will love it. I designed this so that I could make that large triangle at the bottom – no joke, that’s exactly what I wanted. I didn’t carry the yarn like I normally do, I used 2 skeins of Fisherman and 1 of Blueberry to make the section. And I only made this pillow one-sided. 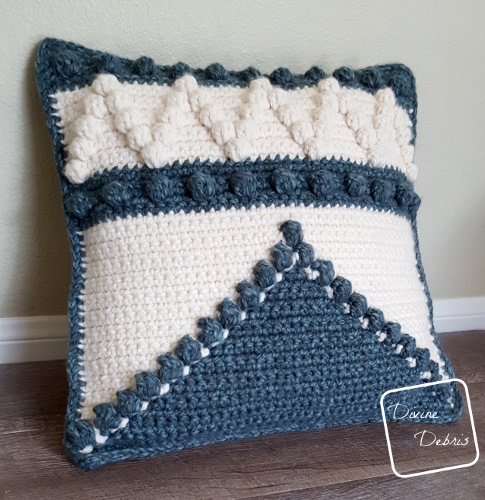 I just like my pillows that way (it makes it so much easier to design too 😀 ). Oh! And I think this would make a fantastic bag, too, if you worked it up like the Crayons are Cute Bag. This pattern is worked in 3 sections: the Front, the Back, and Securing. The Front and Back are worked back and forth in rows, with a turn at the beginning/ end of the row. 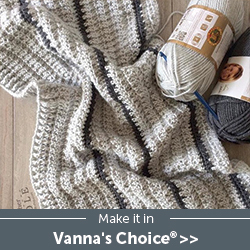 The stitches in the sides portion are a combination of single crochets and bobble stitches. 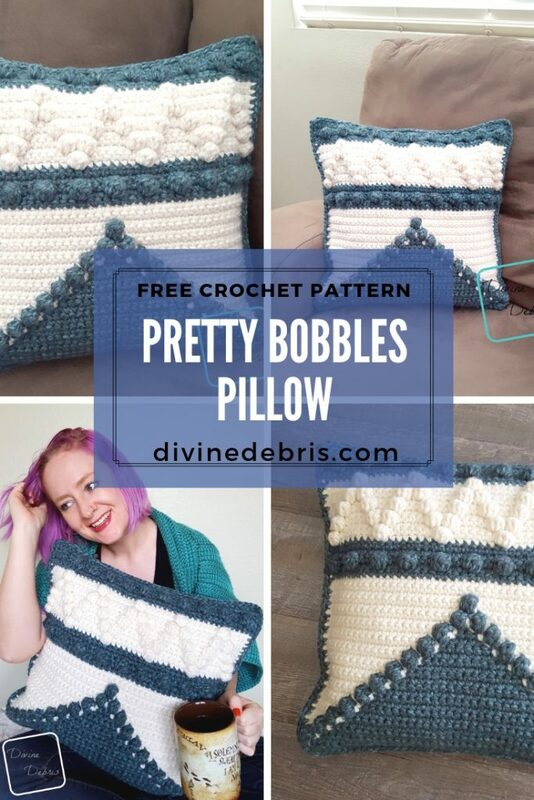 The directions will only tell you what color (ie: Color A, Color B, etc…) and the number in the parentheses tells you how many single crochets/ bobble sts to make. EX: B: (1), A: (1), B: Bbl, means sc, sc, bobble in color B, A, B (in the order). Rounds with just A: (10) mean just single crochets are worked. The yarn wasn’t carried across the tapestry/ bobble section, instead the use of bobbins like they did on Hodgepodge Crochet is suggested for this pattern. You can carry the yarn across but I did not. I used 2 skeins of Fisherman/ White and 1 of Blueberry/ Blue, dropping the inactive yarn as I went across the row. Color A is off white (Wool-Ease Thick and Quick in Fisherman/ 2 skeins) and color B is blue (Wool-Ease in Thick and Quick in Blueberry/ 3 skeins). Create the back in any color or make it a stash buster and use many colors! 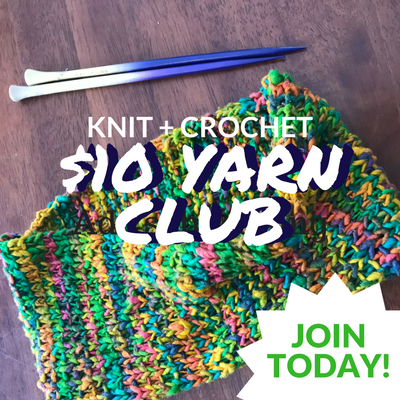 I want to thank Lion Brand Yarns again for sponsoring this blog hop, I had a fun time doing it! Now go check out the other designers posts! 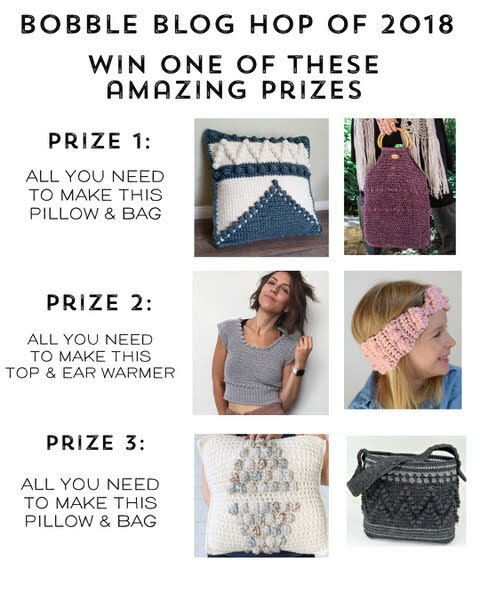 In addition to all these awesome designs, there’s also a GIVEAWAY! Stitch & Hustle will draw the winners over the weekend of the 13th. Stitch & Hustle will send all of the winner details to each of you for your own marketing or follow up. 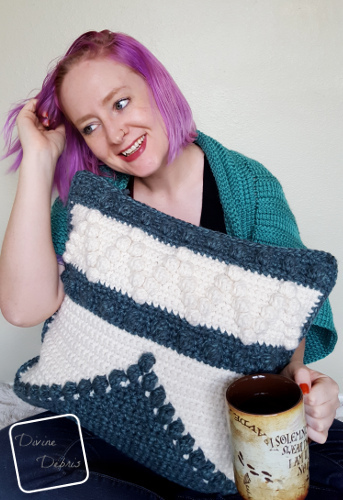 The winner is announced on the Stitch & Hustle blog as well. Stitch & Hustle will reach out to the winners to get all the delivery details then provide shipping information to Lion Brand. Prizes will ship directly to the winners from Lion Brand if USA or Canada and if elsewhere in the world then will have a longer ship time for LB to first ship to me. THERE WILL BE THREE WINNERS!! !